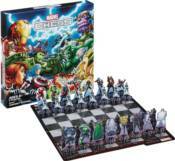 Marvel's heroes and villains are going head to head in this classic game of wits and strategy. There are 16 hero pieces and 16 villain pieces, each representing a classic chess piece from pawns to king. Among the heroes are Marvel's Spider-Man, Iron Man, Star-Lord, and Hulk, and featured villains include Hydra Agents, Venom, Loki, and Thanos.